As dawn breaks on January 1st 2015 it’s time to reflect and wonder about our plans for 2015. The past is always the past, unchangeable and with every moment transitioning rom experience to memory. The future though is very different. We are not really into New Year resolutions, but the 1st day of the year is a time to think and reflect back on 2014, but more importantly PLAN for the year ahead.We stand today at a time and place where 2015 is at our beck and call. We have an entire year to mould and influence. An entire 365 days to wring as many experiences, pleasures, challenges and successes as we can. The future is ours to influence, so what can we suggest that you do in 2015 to make it a great year in medical education, #FOAMed and resuscitation? In 2015 the St.Emlyn’s team are going to be working hard. Expect to hear more on the blog, the podcast and on some new exciting projects that will with luck and fortitude make the world a better place. One thing that we would love you to do is join us in Chicago the June. The SMACC conference already has over 1000 delegates registered and the rollcall of speakers is AMAZING. It is going to be the highlight of our year and we hope that it will be the highlight of yours too, as you will be there with us enjoying the awesomeness, vim and vigour of the world’s best conference. 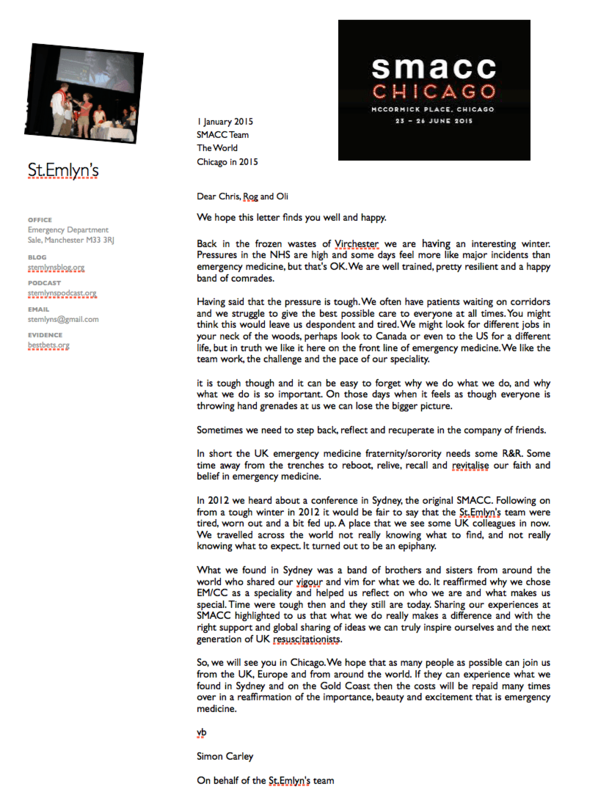 Read our open letter to Roger Harris, Oli Flower and Chris Nickson on our epiphany in 2012. At the risk of sounding a bit evangelical (no apologies as we are) it was a turning point for all of us who attended and we haven’t looked back since. We’d love you to have the same experience. Read our open letter to the organisers and just think about it. Listen to our podcast on SMACC. Listen to Scott Weingart on why he is going to SMACC in 2015 & just visit the many #FOAMed blogs out there to see just how many people will be attending. Come and rediscover your awesome.